Crew: Nabhi, Chandu, Basalinga, Siddu n me. Brief about the place: Located on the Mondovi in the Indian state of Goa on Goa's border with Karnataka state. 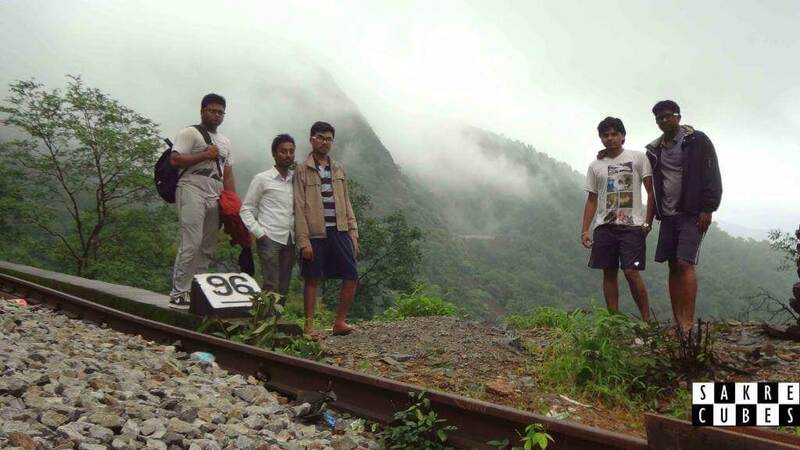 Trek from Kulem to Dudhsagar - 11 km The famous photo of Train passing through before the waterfalls can be seen in this route and also a complete stretch of the falls is visible while hiking towards waterfalls. Trek from Caranzol to Dudhsagar (7kms): Caranzol is the midpoint between Castle Rock and Dudhsagar. The train stops here for a minute or two on Sunday, I am not sure if it will stop on weekdays. 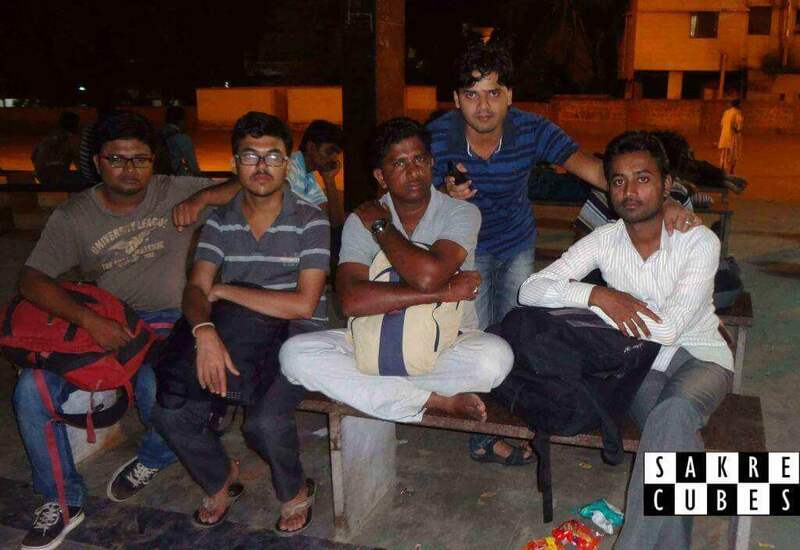 Saturday night: Assembled at Ilkal bus stand at 11 pm; Raichur - Panaji bus came at 11.30 pm. The road is pretty good but the normal buses are horrible for long distances. There were many humps on the road where the driver didn’t bother to apply break, no pushback seats. Didn’t get sleep for the next 4.5 hours. Sunday Morning: Reached Belgaum bus stand at 4.15 in the morning. Had a hot cup of tea and boarded on the same bus which dropped us at the railway station. The auto driver will take around 20 Rs/head. 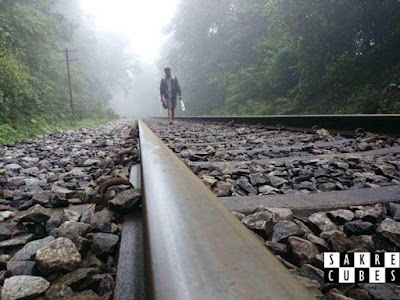 The train scheduled at 8 am and the lady at the ticket counter said tickets will be available after 5.30 am (135 Rs/head to and fro). 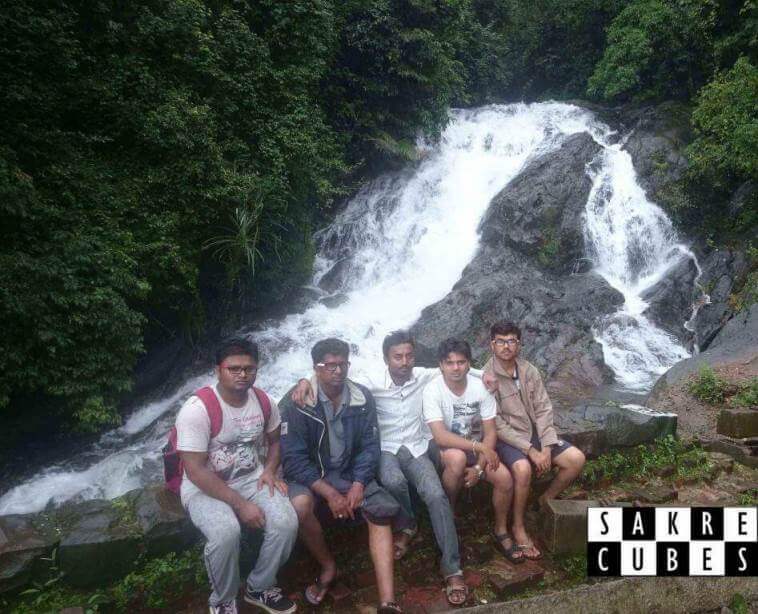 We decided to take rest for 3 hours at the lodge. Hunted for nearby lodges but disappointed as lodges were full. Had a hot cup of tea at a bakery outside the station. As there is nothing available to eat at Dudhsagar we took break n jam, some cookies, water, and a cold drink. Maybe on Sunday, one may get tea, chiwada, cigarette at Dudhsagar station (all at the double rate) but for the rest of the week, there is nothing available, better have your lunch packed. 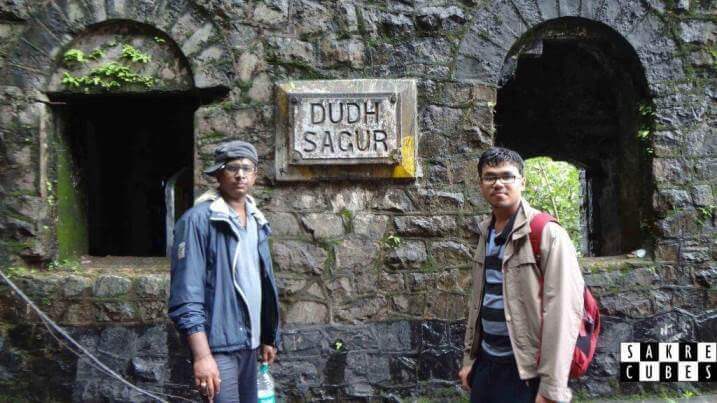 Since we decided to trek from Castle Rock to Dudhsagar (14 km) we didn’t want to burden our shoulders with heavy bags so deposited two bags at locker room ( 16 Rs/bag, lock compulsory) with unnecessary things. 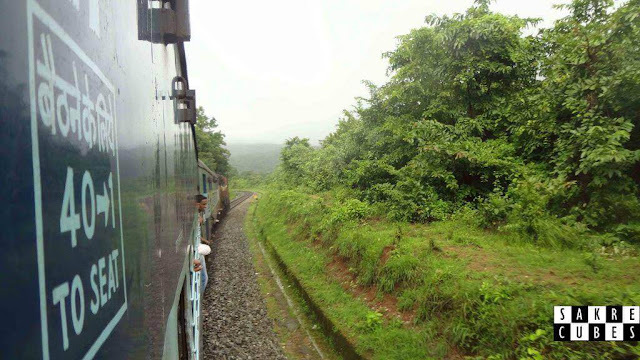 Train Journey: Train arrived at 7.40 am; we were standing at the door to enjoy the green ride; train goes through the thick forest, trees till the horizon, paddy fields at the side, the fresh breeze, unexpected rain, cold makes your journey memorable. 9.30 am we reached Londa Jn, the train stops here for 20 to 30 minutes. 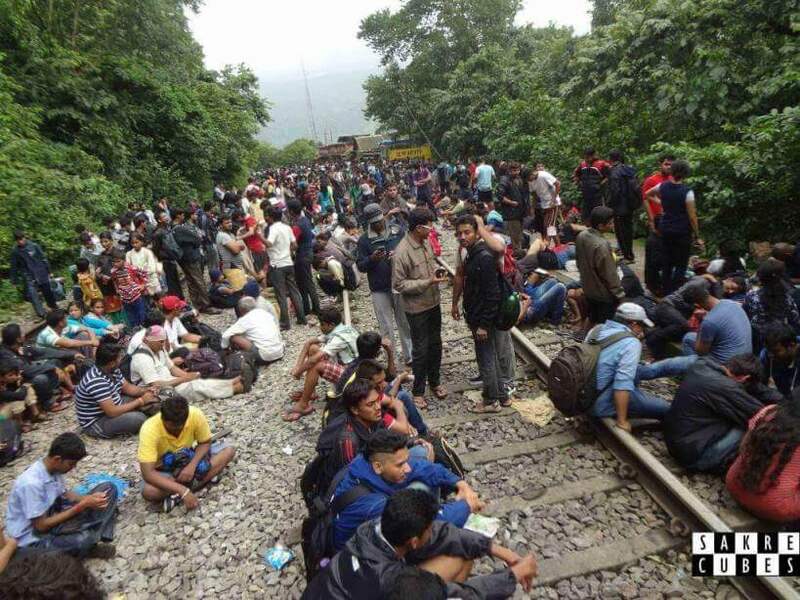 People coming from Dharwad hop on from here. The train got even more packed. 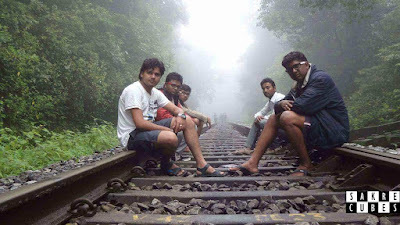 We were standing on a single foot and the journey was no more memorable :P. Reached Castle Rock at 10.45 am, the place where we were supposed to get down and trek for next 14 km, we were exhausted, no one had slept for the past 27 hours, tired, and train compressed us to death, leg paining like hell, it’s already 10.45 am, the return train is at 5 pm, heavy rain so we decided to give up. Many enthusiastic trekkers got down. Train left in 5 minutes. There were many tunnels the train goes through, as the train was passing each we were regretting for not getting down. Luckily train stopped at Caranzol which was unexpected because next stop after Lounda Jn is Dudhsagar, maybe Sunday the train stops here. The trekking: The real journey starts here. From Caranzol it's 7 km, so half of our distance was already covered which should nullify the effect of sleepless nights, time lag and body pain. 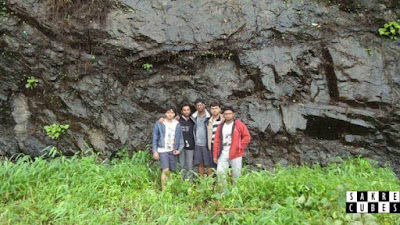 We started trekking at 11.20 am, in the beginning, it felt easy as you just have to keep the foot on those horizontal slabs which are placed at a perfect distance and there is no chance of missing the route as we just have to follow the tracks. There were many groups trekking along with us which gave us confidence that we are not alone. Almost 90 % of the people were drunk, be careful not to mess with them. Captured so many moments this reduced our pace. Sun was playing hide and seek beyond the clouds, the rain drenching us again and again. There is plenty of space to stand aside in case train comes, the train will keep on honking the horn as they know many people would be walking on the track. 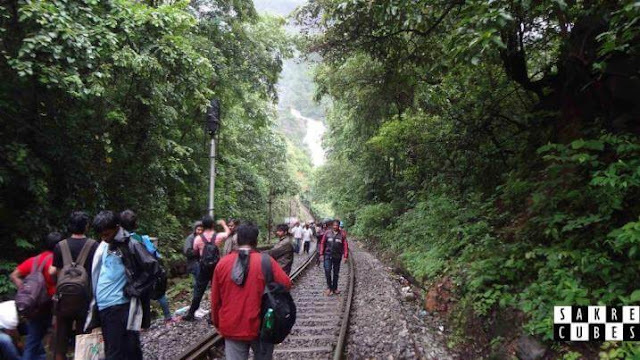 After a couple of km, everyone got leg pain, the tricky walk on the track is not that easy, we were on slippers which is not at all recommended for a trek like this. 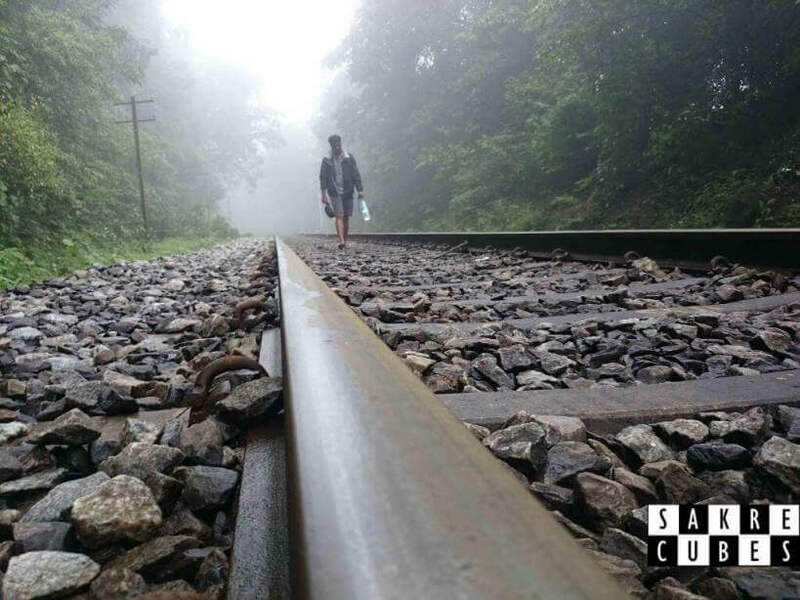 It’s no fun to walk on the track, in fact, it is hard, challenging and difficult, the rain will drench even if you are wearing a raincoat, the bags if not waterproof would become heavy. 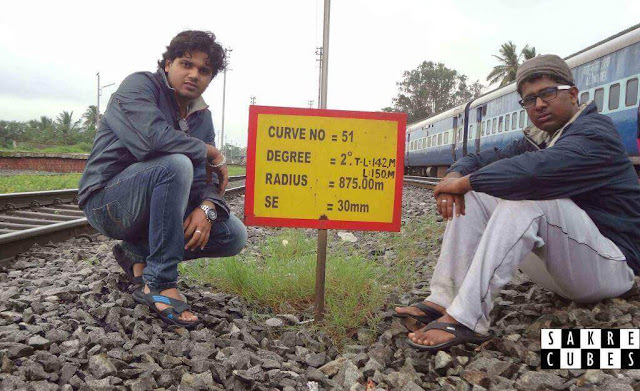 Remember one thing to calculate time to travel we have to consider not only the distance but also stops for viewpoint, time for snaps, rain, walking on track != walking on plain surface, the pain because of walking on those thin slabs on the track, the train crossing, the fear of bridge and height etc. If you don’t control pace then it will take 3 to 4 hours to complete 7 km. 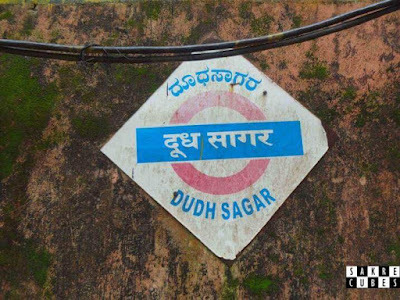 Dudh Sagur or Dudh Sagar? Didn’t have much time to relax, we had to move on. We entered the first tunnel, walking inside the tunnel is little difficult if u forgot to bring a torch, even phone flash would work (I recommend to keep a torch). 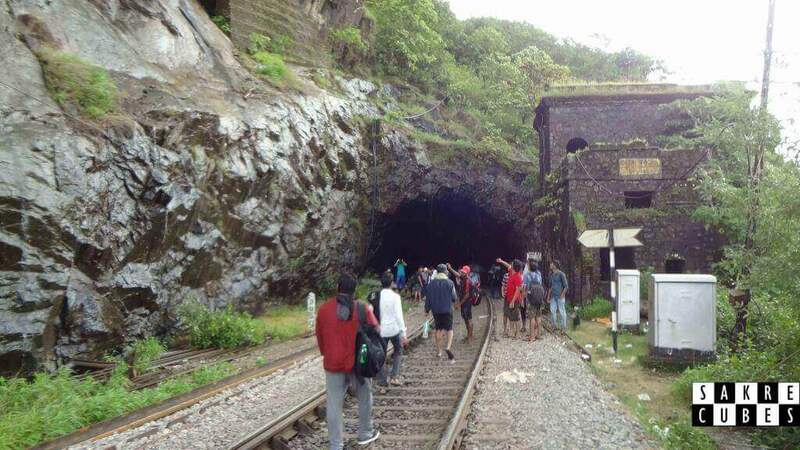 The dark cave is really thrilling, there is plenty of places to stand aside in case train comes, no bats, no fear. Moving on... Chandu got leg cramp; the pain relief gave a quick relief. Each step was becoming difficult. No time even to sit and eat. 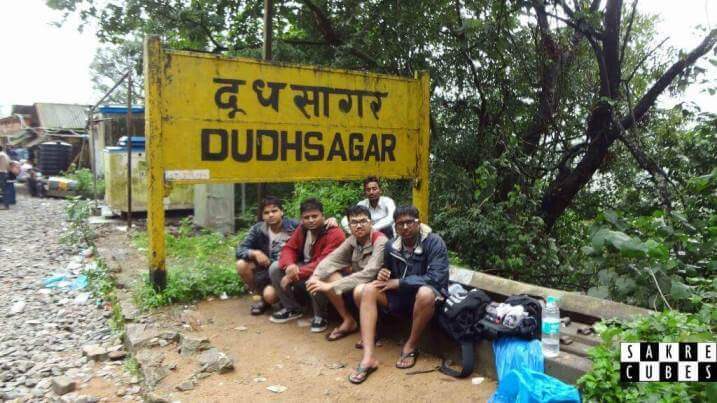 After crossing a couple of caves we reached Dudhsagar station time: 2.10 pm, took around 3 hours to complete 7 km. It’s still 500mts to the falls. The Sea of Milk: The sound of the waterfall was audible, there is the last cave beyond which lies giant waterfall. 5 min we were on the bridge in front of the falls. There are no words to describe it. 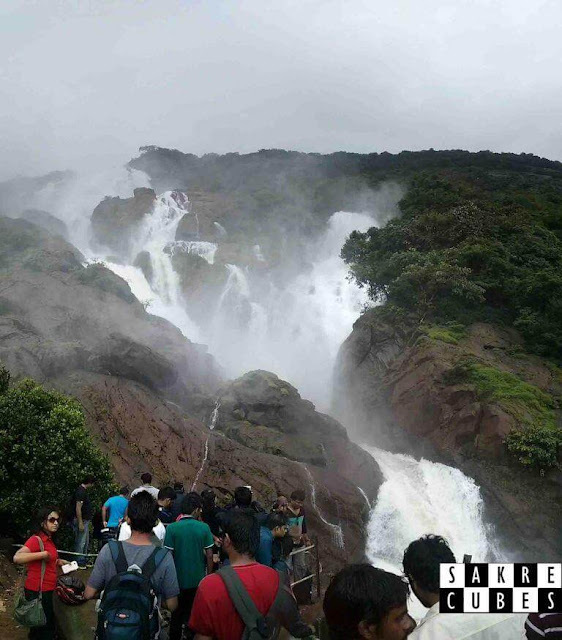 It’s milky white, running at heavy force one could never imagine, the water dropping from the cliff looks like condensed clouds moving at slow motion, there is a gap of around 100 mts between falls and bridge. Hats-off to the engineering which made this bridge and to the one who named it the perfect way “Dudh Sagar”. The force of the water flowing is really speechless, I had never seen falls flowing with this force. We took a couple of photos in front of the falls, after half an hour the wind was flowing in the opposite way (or it was raining?? 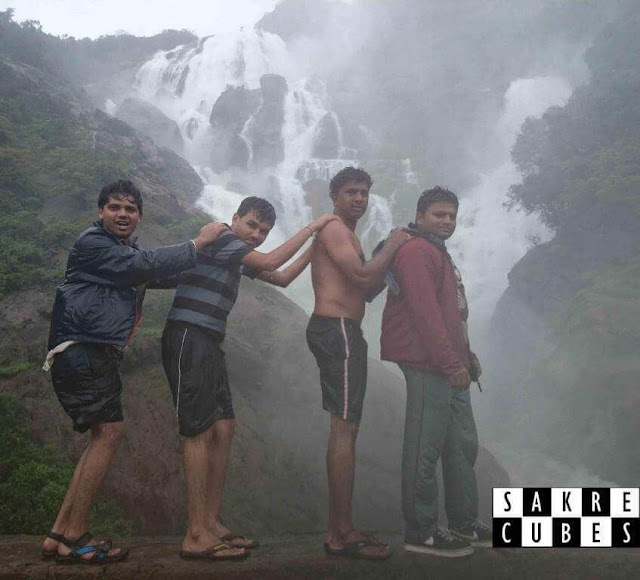 don’t know) we all got drenched again, there were group of drunken people who got into the water, the edge is so near and water is flowing at a very high force, those people are fools more than daring person. The photo session in rain: We spent a couple of hours dancing in rain, enjoying, taking photos with Nabhi's Experia Z1. Felt it was worth of time, energy and pain we went through. There is a viewpoint from which one could see the legendary view of the falls. We had no energy to trek for 1.5 km. If you get down at Kulem then this viewpoint is on the way to the falls. 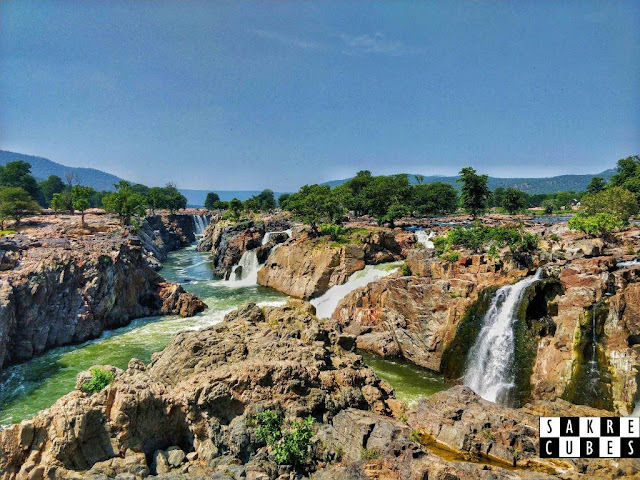 There is one more station which is 4kms from the falls which go through this viewpoint (falls -> viewpoint -> station -> Kulem). 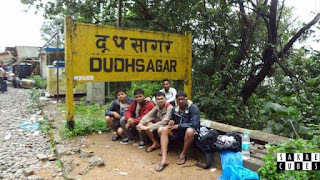 We came back to Dudhsagar station at 4.45 pm, the station was full with people, we never realized there were so many visitors with us almost there were 4k - 5k people waiting to catch the train which is already filled. 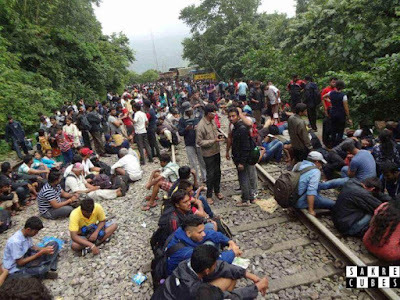 We all were afraid because, if this train misses then there is next train at 3 am, though train master might get us on the goods train but it will go till Londa Jn. Train arrived at 5.40 pm (scheduled 5.30, nizamauddin super fast express, vasco to nizamauddin). 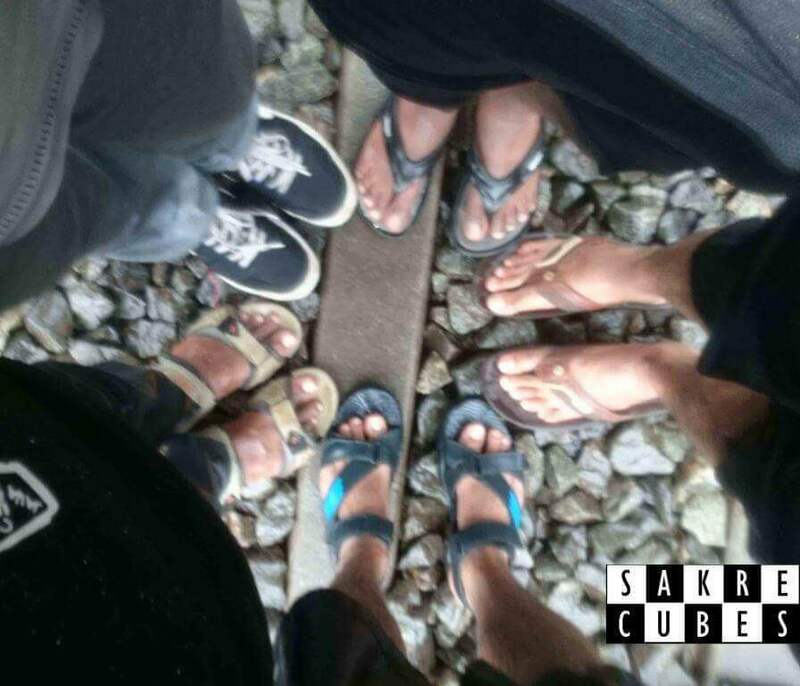 Somehow all got into the train, the train was literally packed, and we were compressed to the highest compression ratio. Almost every one cooperated as we can’t leave any person behind. The police and train master made sure that everyone gets into the train. 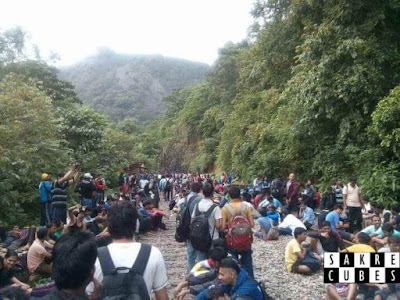 After half an hour train left (time: 6.10 pm), half of the people got down at Caste Rock as many people had come on a private vehicle and there is road facility till castle rock. Some more people got down at Londa jn, a train packed up again, reached belgaum at 8.50 pm. Had a full meal at famous Niyaz hotel, near the bus stand. We came to bus stand at 10.45 pm waited till 1.30 am for the bus, it’s been 42 hours since we had sleep. Finally, we reached Ilkal by 6.30 am. Dudhsagar waterfalls is a wonderful and lovely place to visit. 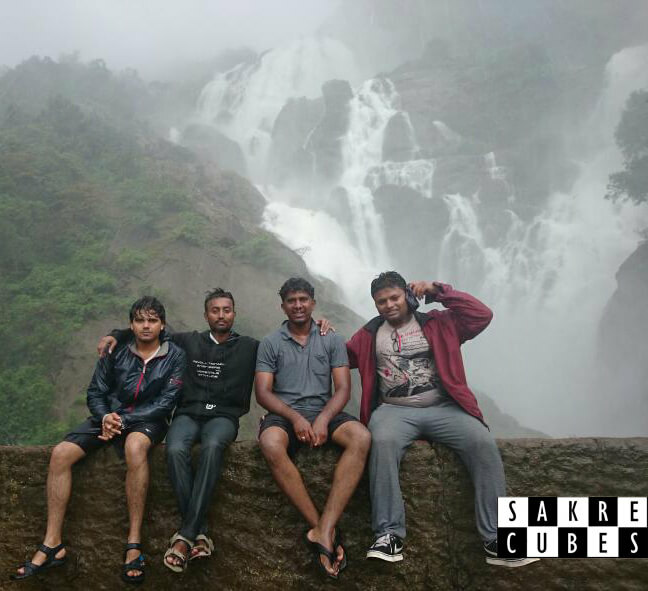 Thanks for sharing about your wonderful travelogue in this blog. Planning for the trip to this place with friends. This blog really gives clear idea for the trip. If anyone want to travel this place then book your bus tickets in advance in Konduskar Travels. 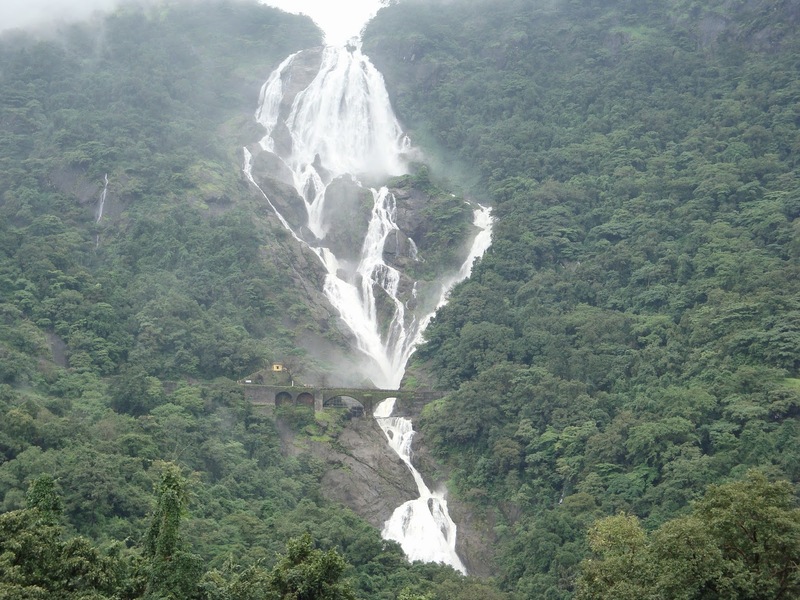 Dudhsagar Waterfalls is a great place to visit in Goa. Wanted to peruse this post. 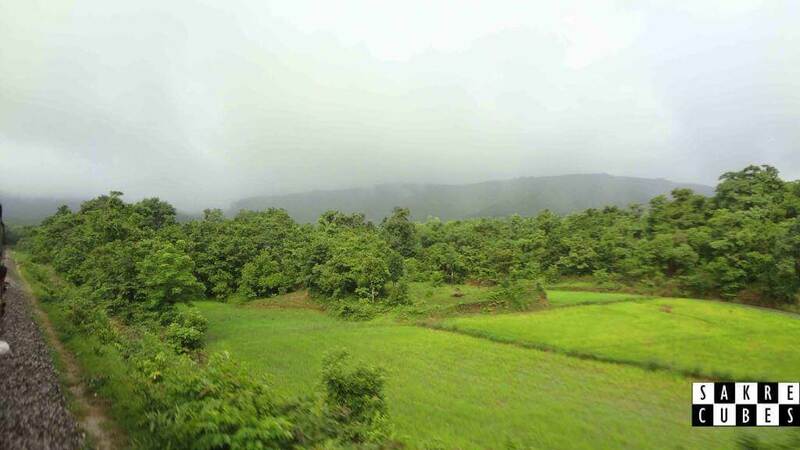 A debt of gratitude is in order for sharing about this delightful place in this blog. 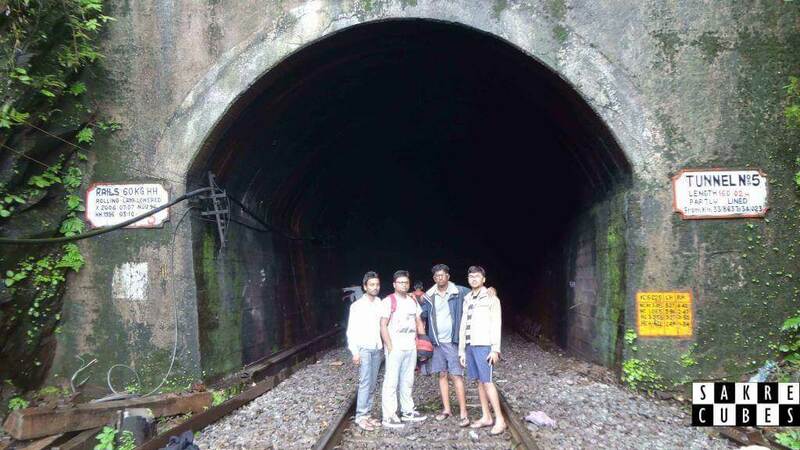 Astounding spot to visit in Goa.